According to the S&P/Case-Shiller Index, home values rose 2.2% nationwide, with all 20 tracked markets making month-to-month improvement. On an annual basis, 17 of the 20 Case-Shiller Index markets improved. Despite the positive report, however, our enthusiasm for the May Case-Shiller Index should be tempered. This is because the index’s methodology is less-than-ideal for today’s Scottsdale home buyer. Perhaps even more important, though, is that the Case-Shiller Index ignores a basic tenet of the housing market — all real estate is local. It’s not possible for 20 cities to represent the U.S. housing market as a whole. Even more egregious is that the 20 markets tracked by the Case-Shiller Index don’t represent the country’s twenty most populated cities. The Case-Shiller Index specifically excludes home sale data from Houston, Philadelphia, San Antonio and San Jose — four of the nation’s 10 most populated cities. Yet, the index does include data from cities such as Minneapolis, Minnesota and Tampa, Florida. These two cities rank #48 and #55, respectively. Furthermore, in its 20 tracked cities, the Case-Shiller Index still manages to fail as a reliable housing market barometer. 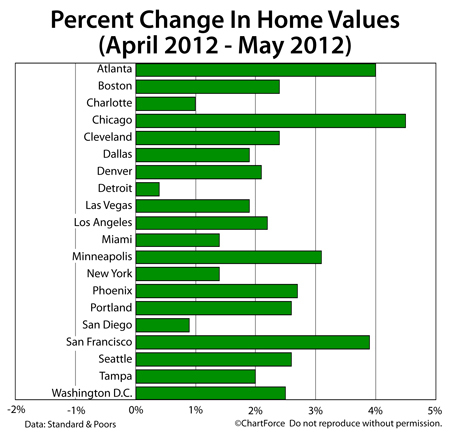 This is because home values vary by zip code, by neighborhood, and by street, even. All 20 Case-Shiller Index cities showed gains in May, but there remains areas within each metropolitan area in which values outpaced the Case-Shiller Index findings, and areas in which values fell short. The Case-Shiller Index provides broad, generalized housing market data and that works for an economist. For an active home buyer or seller, though, making smart real estate decisions requires having timely, relevant real estate data at-hand when it’s needed. For data like that, talk with a real estate agent.